We are a law firm with offices in Los Angeles, San Diego and the San Francisco Bay Area. Our practice is focused on providing highly specialized asset protection legal services for clients in California and throughout the country. When helpful, we can arrange a personal meetings with our clients in one of our convenient locations. Our asset protection legal work includes advising clients on estate planning, international and domestic tax planning, real estate transactions and business reorganizations. Our expertise is developing creative legal strategies necessary to accomplish the client’s goals. 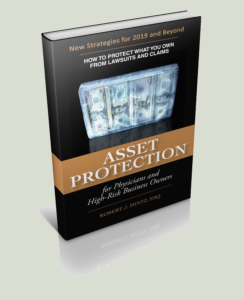 Robert J. Mintz, is a practicing attorney in California (CA State Bar #86851), and a nationally recognized legal expert with more than 20 years of experience in asset protection, estate and tax law. Mr. Mintz is a member of the California Bar and has practiced law in California throughout his career. Mr Mintz received his undergraduate degree from the University of California, Berkeley. He obtained his J.D. degree from the University of San Diego School of Law and a Masters in Taxation (LL.M) from Boston University School of Law. Mr. Mintz has written extensively and taught in the areas of asset protection, tax and estate planning. He is the author more than fifty articles on asset protection and three popular and influential books on these subjects: Lawsuit Proof: Protecting Your Assets from Lawsuits and Claims (1991,1996); The Privacy Plan: How to Keep What You Own Secret From High-Tech Snoops Lawyers and Con-Men (1998); and Asset Protection for Physicians and High-Risk Business Owners. All of our legal work is performed exclusively by Mr. Mintz, in direct contact with the client at all times.